Before coming to today's recipe, I would like to show my work that was done this weekend. 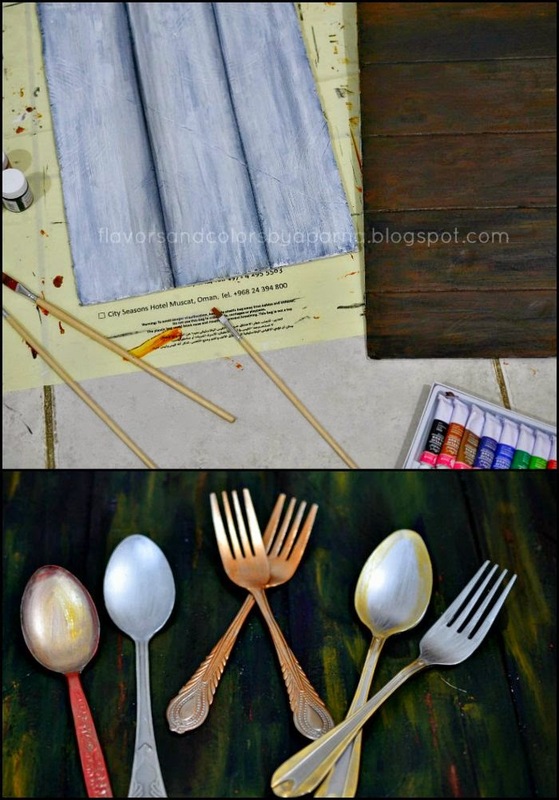 I am always in love with these painted wooden planks been used as background for food photography and have been fascinated by so many DIY ideas floating on net for painting these boards. Somehow didn't know how to go about doing it myself , as I was sure I will not be comfortable picking those planks from garbage pile out on the road. Buying them from hardware shop is always an option but the price tag on them just meant it to be an expensive project in the place where I stay and since this was only for photography purpose I decided not to spend so much. Then I came across a reasonably doable not so expensive DIY option/idea. For many days the project got postponed for known and unknown reasons, until this weekend while driving back home I took a halt at hardware shop picked up some colours, brushes and decided to do it. Below is the pic of the finished work - painted boards and painted spoons. Now all eager to click food pics on these backgrounds and you hope to see them soon in future posts ! It took me about 4 hours from start to finish and complete the above work which means I was left with little time and no energy for cooking. I decided to keep the meal menu simple and hubby came in suggesting for some yummy tomato saar to go with hot rice. While checking for veggies stock in the fridge back in my mind I was thinking about which saaru can be prepared in jiffy. 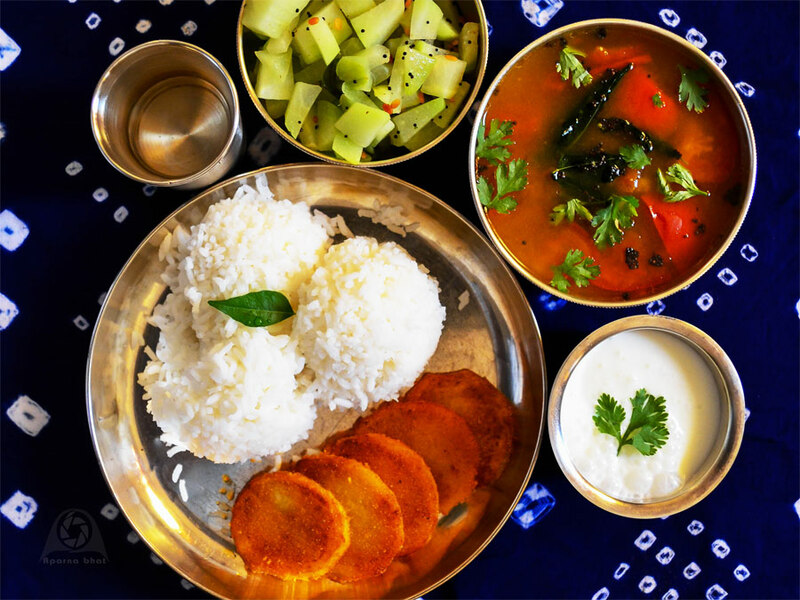 We have many versions of saaru like Devasthan saaru [served in temples during festivals and functions], Karbeva saaru, Harvo tomato saru, Instant version with ready to use rasam powder, Instant one with freshly ground spices, Vardhike mantava saaru [ saaru served during wedding feast], Udupi saaru etc. With these many saarus, I am not able to register the ingredients and their proportions. Hence note each recipe even with its minute variation and refer back to them most of the times. While flipping through the pages of my diary I found a recipe for instant version of tomato saaru shared by my friend Seema S. I love such recipes which come handy in situations as seen above. I tweaked her recipe to suit my family preferences. As I began to make the saar, hubby helped in cleaning and chopping other veggies. Seemebadnekayi [Chow chow] upkari/ sabzi, Potato tawa fry and plain salted buttermilk been served with this hot saaru and rice as seen in the below pic. Now isn't that meal ideal and comfort food when you are tired? Wash and clean the tomatoes. Dice them and boil in enough water. Add tamarind extract and salt to taste. Once cooked switch off the flame. Prepare the ground paste with ingredients mentioned under masala. Add the ground paste to the above tomato mixture, required amount of water to adjust the consistency as per your preference, small piece of jaggery and continue cooking for 5 mins. Add finely chopped coriander leaves and season it with mustard, curry leaves and pinch of hing. 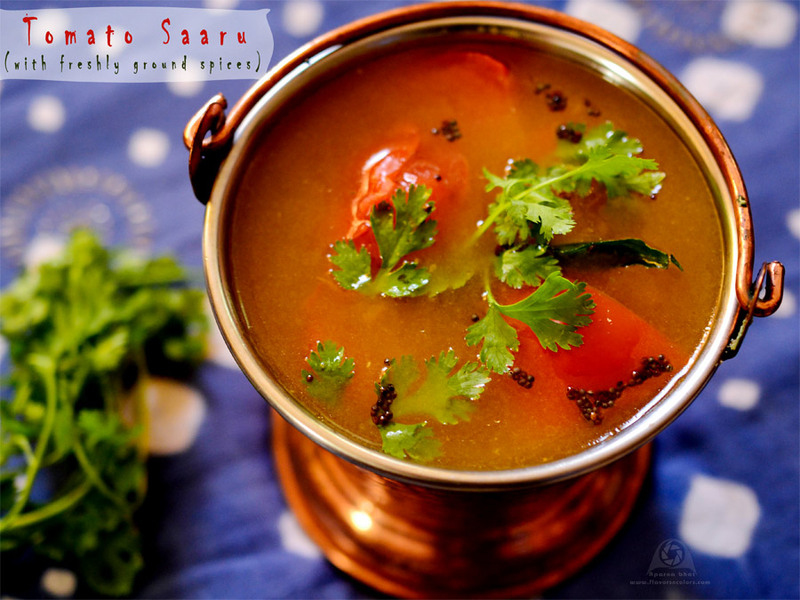 Garnish with coriander leaves and serve it hot with rice. You can drink this saaru as it is just like soup. Although I wanted to click this saaru on newly painted background, had to show my patience. The boards were still sticky to fingers and colours were yet to dry completely. If you are interested to know how did I do them and what was the material I used ... do let me know and leave a comment. Would come up with a post on how I painted them. With the amount of peppercorns used in the above recipe, kids may refuse to have it [happened at my place], so kindly adjust the spice levels as per your choice. Lovely dish and brilliant pictures! Love the boards aparna! !1 you painted the spoon too wow!!! Do a post on the painted board, will be useful to people like me!! I have bought 4 boards, but lazy to buy paints and start painting them!!! Hope your post will kick my lazy **** to work!!! I feel lazy to paint boards, after seeing urs and felt like painting some soon. Saaru looks absolutely comforting. Same as Priya. please do a post on painted boards. Also where did you buy the boards? Painting boards have be on my to = do list but am unable to find the right boards. thnku Usha , btw these boards are not wooden planks,, would let u know what they are in the post that i m planning to do soon. Painted Boards & spoons look great. What spoons did u use (steel??) and what type of paint did u use? Aparna, those pictures are looking so fantastic..love your new boards and spoons!..very creative..pls do a post on how you did, will be interesting to read that.